This is a network of loosely connect double track and single track strewn out on both sides of Bearded Vulture Pass Road (in Mongolian "Yolin Davaa"). Most of the trails follow the long valleys and ridges that work their way up the mountain slopes on both sides of the pass. There are a few trails here and there that run pretty much parallel to the top ridge and also parallel to the base of the mountain on both sides (along the Tuul River on the back side). These help connect all the other trails. 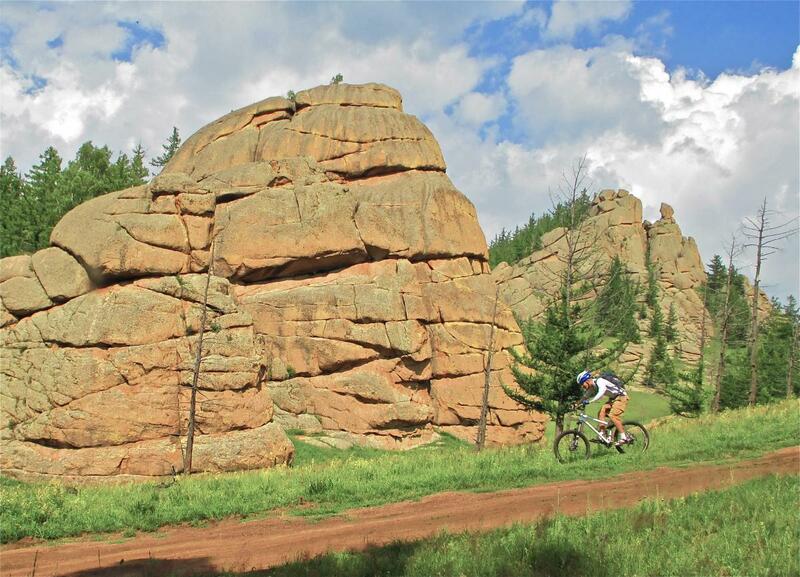 You can do a lot of exploring in the area to find some favorite portions of trail. Bring Google Earth sat images and a compass to assist in navigation. The trail surface is mostly loose granite scree on more worn trails or grass on less worn trails. You also have many options to ride no track and venture down the big slopes on whatever line you prefer. There are many small rock formations to play on. The area is an exceptionally beautiful landscape with large vistas, many cliffs and large rock formations. Wildflowers are abundant in the summer as are large birds of prey (eagles, lammergeiers and kites). It is also an awesome rock climbing area full of virgin rock. Review: Big climbs and long fast descents. Some areas are very steep. Views are exceptional. There is a good 20 miles of trail here. If you want to go further, you can easily connect to trails on the back side of the mountain near the confluence of the Tuul and Terelj rivers. Bearded Vulture Pass Trails MTB Trail 4.00 out of 5 based on 1 ratings. 1 user reviews.